Halwa plate with Width 26 Gage and height is 5.5 inches . Minimum order qty is 100 K.G. if want to buy more kitchen & Dining product then you can get combined order like 500 k.g. or 1 Ton. 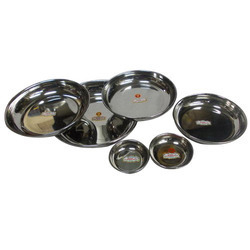 We have gained a remarkable position in the market that is involved in offering Stainless Steel Dessert Plate. Party Square Dessert Plate are made from naturally fallen leaves of Palm Tree (Areca) Earth Friendly / Renewable / Sustainable / 100% Natural. We are manufacturer of Plastic dish. Reckoned amid one of the credible market names, we are willingly betrothed in offering to our patrons 6 Inch Sweets Plate. Transparent Tray uesd for serving dessert, gives a primum look to the product served in it. 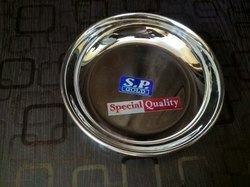 Our company has achieved widespread recognition in providing Round Beeding Halwa Plate (Halwaplate (R.B) (6pcs. Box Packing)).